Have you wanted to try cheesemaking but been too intimidated? Do you enjoy spreadable cheese but don't like the long list of questionable ingredients on most commercial cheese spreads? I've got a wonderful cheese just for you! Fromage blanc (literally, “white cheese”) is the easiest cheese I've tried to date, even a bit simpler than kefir or yogurt cheese. 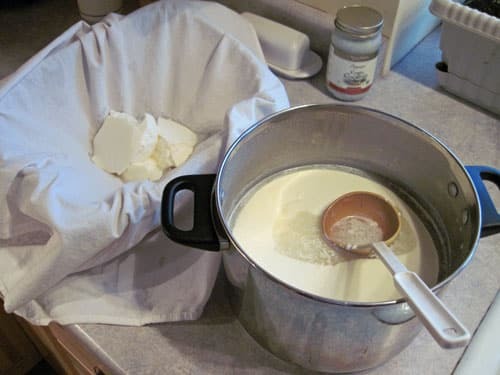 (Kefir or yogurt soft cheese can be made by draining the milk kefir or yogurt until thick, but of course I have to make the kefir or yogurt first, which adds more steps.) 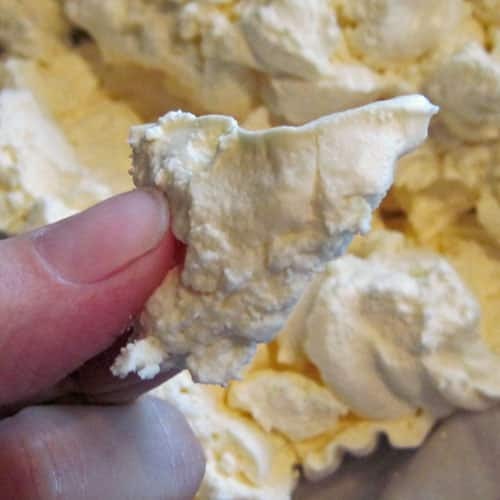 It has a consistency somewhat like cream cheese or fresh chevre. I use it in recipes or add herbs or other flavorings to use it as a dip. I like to start this cheese just before bedtime, let it culture overnight, and drain it in the morning. 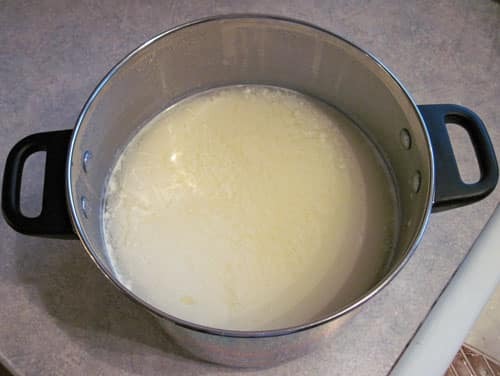 In a large pot, heat milk to 86 degrees. Add the starter and mix well. Cover and let set at 72 degrees F for 12 hours. 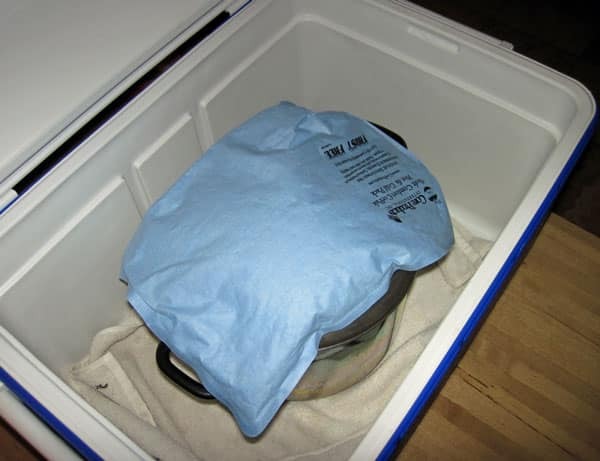 Since it gets cool in my kitchen overnight in the winter, I've been placing mine in a cooler with a warm hot pack. I tuck a big towel around it to keep it cozy and absorb any moisture (there is generally a bit of condensation). After 12 hours, the curd will be firm and the whey will be separated and slightly milky. I place my big over-the-sink colander in a large bowl and line it with a large flour sack towel. You can also use butter muslin or a double layer of cheesecloth. The cheese will just about fill the colander at this point. It shrinks up as it drains. Right now it looks more like thick yogurt. Tie the ends of the cloth and hang to drain at room temp for 6-12 hours. Shorter drain time = softer cheese, longer drain time = firmer cheese. I generally hang for 6-8 hours. As you can see, it produces quite a bit of whey. You can use the whey for drinking (freeze it in cubes to use in smoothies for extra protein), use it to make live culture foods, feed it to critters, or water outside plants (I think it might get too smelly inside). When the cheese is done, it'll be dry and fairly firm. At this point you an use it “as is”, or add flavorings. It'll keep for up to two weeks refrigerated in a covered container. One gallon of milk yields about 2 pounds of cheese (which is about twice as much as a batch of mozzarella). Cultures for Health has a whole list of flavor ideas for soft cheeses, such as drizzling it with honey and serving it with berries, or using herbs or chopped veggies. 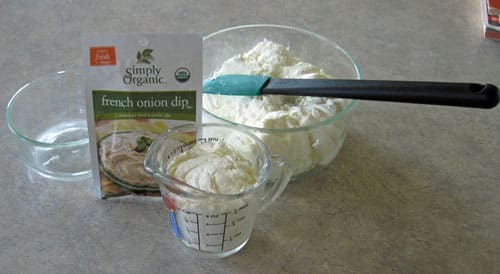 A couple of favorite options in our house are to mix it up like French onion dip with Simply Organic dip mix. I use 2 tablespoons of mix per one cup of cheese. This is what's on the cracker at the top of the post. The boys inhale it. Tipnut has a Spice and Herb blend recipe cheat sheet that I think would be a great source for flavor ideas to experiment with for new combinations. 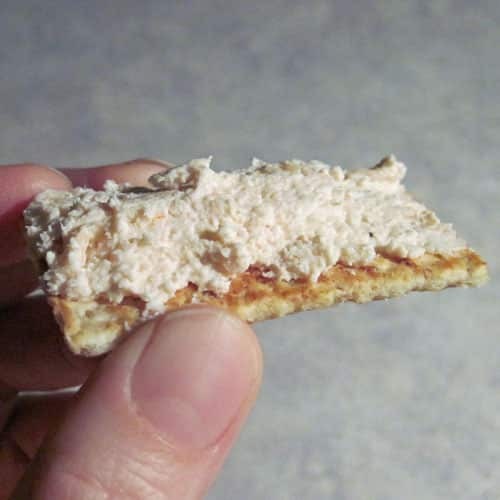 To make a seafood flavored spread, I took 2 cups of cheese, a 4 ounce can of baby shrimp, 2 tablespoons ketchup (homemade is great if you have it) and 2 tablespoons horseradish sauce. It makes a pretty light pink spread. For a meat free main dish, I mix this cheese (flavored or unflavored) with some eggs, bread crumbs or flour, salt, pepper and seasonings to taste, then form into patties and fry in butter. (I promise I'll try and measure the next time I make these. I usually just eyeball it.) I love dishes like this because they go together so fast, and it feels a little fancier than just plain eggs or cheese. I hope you'll try this quick and easy cheese, and that your family will enjoy it as much as mine does. Cover and let set at 72 degrees F for 12 hours. If the room temperature is below 72F, use hot packs or other sources of ambient heat. Place a large colander in a bowl of sufficient size and line it with a large flour sack towel. You can also use butter muslin or a double layer of cheesecloth. The cheese will just about fill the colander at this point. It shrinks up as it drains. Right now it looks more like thick yogurt. The recipe produces quite a bit of whey. You can use the whey for drinking (freeze it in cubes to use in smoothies for extra protein), use it to make live culture foods, feed it to critters, or water outside plants (I think it might get too smelly inside). After it's finished, you can use it “as is”, or add flavorings. It'll keep for up to two weeks refrigerated in a covered container. One gallon of milk yields about 2 pounds of cheese (which is about twice as much as a batch of mozzarella). Don't forget to check out the recipes for 30 minute mozzarella and ricotta from heaven. 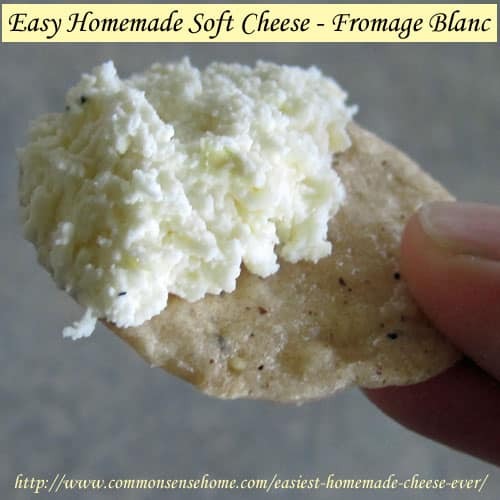 Fromage Blanc can be flavored any number of ways and makes a great spread or dip. Use coupon code FROMAGE at checkout to save 20%. Valid through September 10, 2013. Your purchase helps support this site. Thank you! Love this post. I had no idea it’s so easy. Kathryn – Isn’t it great? Other than the culturing time and the draining time, it literally takes only a few minutes. You can have wholesome “gourmet” cheese spread in a flash. I love quick and easy recipes like this (and the kids love it, too). This looks great to eat and fun to make. I cannot wait to try it. How forgiving is the recipe when it comes to keeping the mixture at a constant 72 degrees? Thanks for the peek into your life. You are a blessing! Given that I have yet to measure the temperature when I’ve done it and it has turned out well every time, I think it’s pretty forgiving. I’m learning that many cheeses have a little “wiggle room” in the temperatures, but recipes specify temperatures to give you a point to aim for when you’re starting out. This looks amazing and so easy to make! Any idea what the nutrition facts would be like? I don’t worry too much about calories, but I did look it up here (http://www.cowgirlcreamery.com/images/Fromage_Blanc.jpg) and they say 80 calories in one ounce, 5 grams of fat, 3 grams of protein, 5 grams of carbohydrates, 10%RDA calcium, 2%RDA vitamin C, 4% RDA vitamin A.
I would love to try this. Probably in a couple of months. Baby steps to DIY! 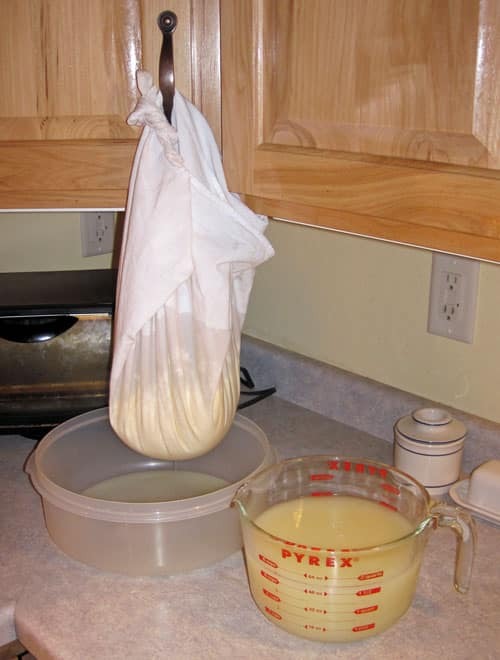 We just made this – started last night around 7:30pm and in the morning poured the loose mess into some cheese cloth. We hung it and around 3pm and scooped out a cup and made onion dip – it was fantastic! Easily as good or better than top-of-the-tater, which is our favorite dip. I’m pretty confident we won’t be buying any store dip from here out. I’m a little confused. The directions say to heat the cheese to 86 degrees. Does this mean the milk? Can this be put into a dehydrator and made into like a parmesian consistency for sprinking on salads and pasta etc? Thank you for posting this….I can’t wait to give this a try…cheese at the store costs a fortune~! I haven’t tried it, but it might work. You could test a small amount to see if you like the results. Hi! I got the culture and milk and went to start the cheese last night. I realized my food dehydrator’s lowest setting is 95 degrees. Can I culture the cheese slightly warmer, but a little shorter? I know some cultures you can play with the temp while others turn into an icky mass if you do that. I think it would be more sour, and am not sure how much time you need to cut off, but you could try it. I normally just pack it in a cooler to hold temp, but depending on your home you may just be able to culture it at room temp, too. You can also use the whey to cook brown rice or millet. It is surprisingly delicious. I have used totally whey or half whey, half water. Yum. Drinking whey is pretty laxative. Drying it slowly in a pan on the wood stove gives you something very hard, quite salty and tasty. I have heard it called gjetost, a Scandinavian whey cheese. 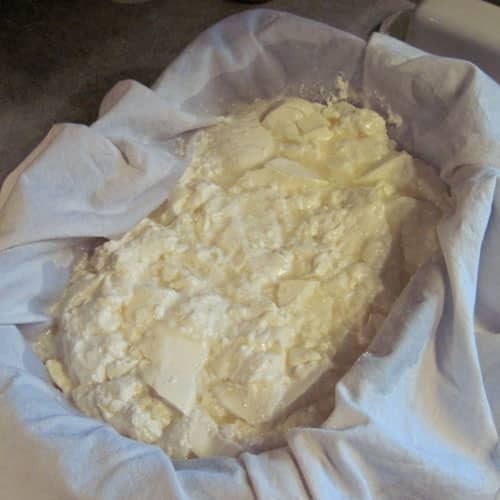 I have been making ricotta cheese since 2008 yet wanting mozzarella. I came across you today, and so very delighted. Unexpectedly more excited to try the “blanc” since I love my mid day meal to be a few crackers, cheese and some veggies for roughage. Thank you for sharing. This looks like it might be my first cheese project. I’m not all that sure what homemade soft cheeses taste like; would you compare the taste of this one to cream cheese or is it just too different? The texture is grainier, not as rich, because you use whole milk, not just cream. It’s more like chevre, if by chance you’ve had that before.